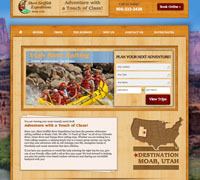 We have a new Rafting Website! We have been busy during the off-season working on many things to make 2013 even better for our guests. One of the major projects we have had fun doing is updating our website, www.griffithexp.com. We have made The Sheri Griffith River Expeditions site easier to navigate, and have included more information and details and photos on each of our trips. We have also added an easy Online booking system. You can book online anytime you like, even if it's after business hours. This system also makes it easy to have other join your trip and send out invitations to your friends. We hope you enjoy surfing our website, and checking out all of the trips and services Sheri Griffith River Expeditions is offering for the 2013 season. We hope to be part of your family's fun this summer!